In some cases, especially with larger networks, we may have multiple choices. Consider a more interesting example, the larger Class B network 166.113.0.0, where we have a total of 15 subnets and the largest has 450 hosts. 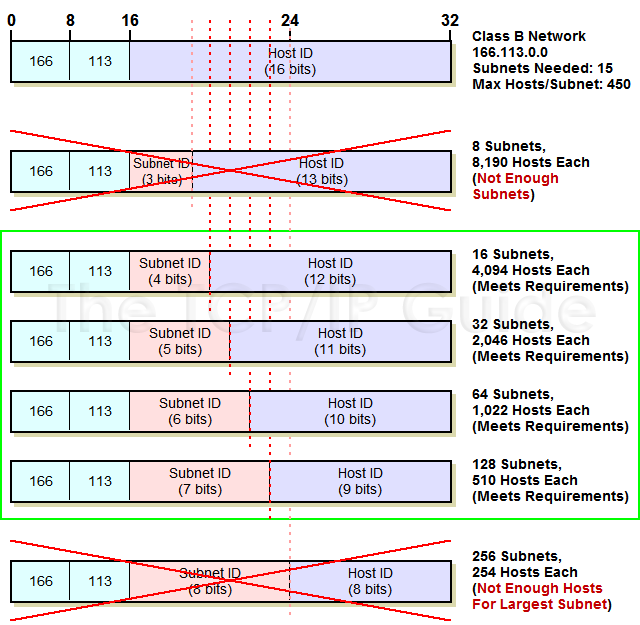 Examining the subnet summary table for Class B suggests four acceptable options, as shown in Figure 75. In all four of these, the number of subnets is equal to 15 or greater, and the number of hosts per subnet is over 450. So, which option should we choose? Usually, we want to pick something in the middle. If we use 4 bits for the subnet ID, this gives us only a maximum of 16 subnets, which limits growth in the number of subnets, since we already have 15. The same applies to the choice of 7 bits for the subnet ID, since we already have 450 hosts in one subnet now, and that limits us to 510. Thus, we probably want either 5 or 6 bits here. If we expect more growth in the number of hosts in the largest subnet, we'd choose 5 bits; if we expect more growth in the number of subnets, we'd choose 6 bits. If unsure, it's probably best to assume more growth in the number of hosts per subnet, so here we would choose 5 bits. The converse problem may also occur: you may be in a position where there are no rows in the table that will match. For example, if our Class C example has 35 hosts in the largest subnet instead of 25, we are out of luck: there is no combination of subnet ID and host ID size that works. The same is true in our Class B example if we had 4,500 hosts in that big subnet instead of 450. In this situation we must either divide the large subnet into a smaller one, use more than one IP address block, or upgrade to a larger block. Key Concept: If there is more than one combination of subnet ID and host ID sizes that will meet requirements, try to choose a middle-of-the-road option that best anticipates future growth requirements. If no combination meets the requirements, the requirements have to change!